Watching Pete and Roger sing ‘The Kids Are Alright’ at Ronnie Scott’s club yesterday reminded me that a few years ago I was asked to pick a favourite Who song to write about for a magazine feature on their greatest songs. ‘Substitute’ had already been taken and so had ‘My Generation’, so I opted for ‘Kids’. Just now I dusted it off and added a bit for today’s blog post. The importance that The Who attach to their song ‘The Kids Are Alright’ was not apparent to me until 1978 when they agreed that it should be the title of Jeff Stein’s superb documentary, the movie that served as a memorial for Keith. Thereafter it took its rightful place alongside many of their better known and more regularly performed songs and, indeed, when the much augmented Who toured the US and UK in 1989, ostensibly to present Tommy on its 20th Anniversary, they called it ‘The Kids Are Alright Tour’. Originally a track on, and a highlight of, 1965’s My Generation album, this enduring Mod anthem was recorded on October 13 that year at the same session as the single after which the album was titled. Although nowhere near as frenzied, ‘The Kids Are Alright’ is equally affecting but in diverse ways, implying that the male-bonding brotherhood of Mod transcends all other relationships, not least those with girlfriends. 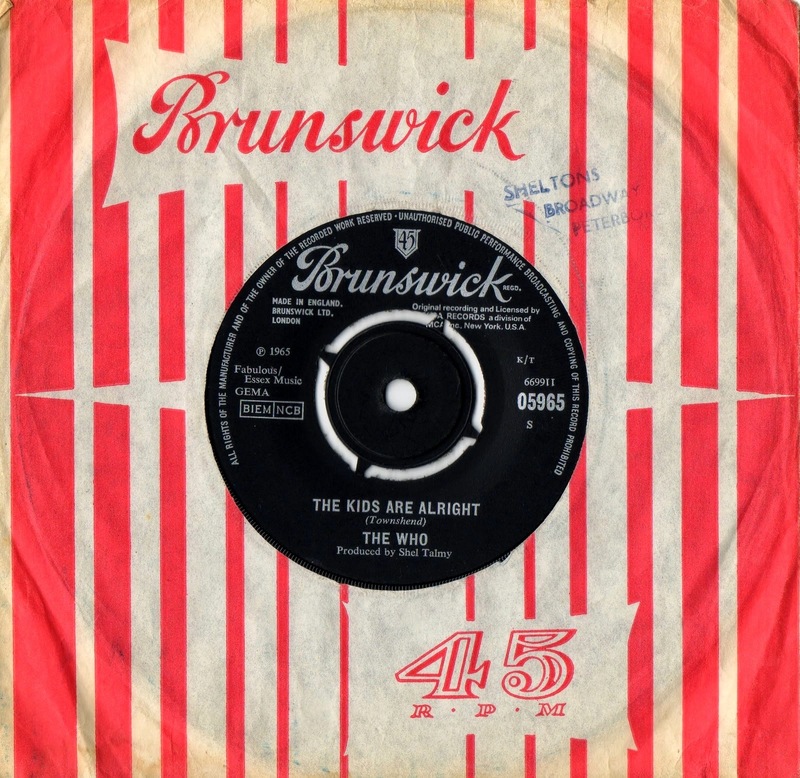 Against the group’s wishes, ‘Kids’ was released as a single by producer Shel Talmy after they’d fallen out with him, and it reached a paltry number 41 in the UK singles charts in September 1966. This may explain why, as far as I am aware, it wasn’t performed live until much later in their career, long after they’d decided the title was perfect for the 1978 documentary. Live, it finally turned up among the encores during the ‘Quadrophenia’ tour of 1997 and was then played regularly during the 1999 and 2000 shows by the rejuvenated five-piece Who that featured the crucial three with Zak Starkey on drums and John ‘Rabbit’ Bundrick on keyboards. At these shows, with Roger playing acoustic guitar, Pete – acknowledging that the ‘kids’ were older now – would vary the lyrics with a little speech about how his kids were alright and how he hoped everyone else’s were alright too. It has been played on and off ever since, both before and after John’s death, sometimes segued into a brief Johnny Cash medley. The title was co-opted by Lisa Cholodenko for her sensitive movie about a lesbian couple and their relationship with a surrogate father, which starred Annette Benning and Julianne Moore, and the phrase itself seems to have become accepted into modern day jargon in much the same way as Paul Simon’s ‘Still Crazy After All These Years’ and, to a lesser extent, ‘Won’t Get Fooled Again’. Nevertheless, whatever its modern day connotations, I prefer the image of The Who miming to the song by the Serpentine in London’s Hyde Park in July 1966: Keith in his Union Jack shirt kicking away at what was probably the first ever sighting of twin bass drums in the UK; John, with stylish sideburns, armed with a white Mosrite bass guitar; Roger, very blond in those days, waving his arms in his white shirt buttoned up to the neck; and Pete as pure Mod in a tasteful dark jacket, running down the chords on his Rickenbacker. Here we see The Who on the threshold of one of the greatest careers in rock and one that, as I discovered yesterday, shows no signs of lapsing 50 years later. Teeth Night Guard is offering precise fitting and highest quality custom made dental protectors.